In the early 1970s, Penny Coleman married Daniel, a young Vietnam veteran and fellow photographer. Soon, Daniel became deeply troubled, falling victim to multiple addictions and becoming strangely insecure. He suffered from what we now call posttraumatic stress disorder (PTSD). After Coleman left him, he committed suicide. Struggling to understand Daniel’s experience, Coleman began investigating the history of PTSD; she found clear cases of the disorder as far back as the Civil War. 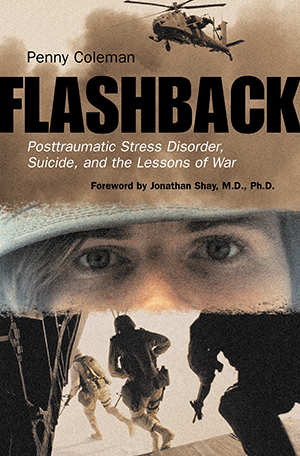 In Flashback, Coleman deftly weaves psychology and military, political, oral, and cultural history to trace the experience of PTSD in the military up through the Vietnam War. She then focuses on Vietnam to show why this war in particular led to such a high number of PTSD cases, many of which ended tragically in suicide. Like the soldiers listed on the Vietnam Veterans Memorial wall, these men are casualties of war. "Vietnam War widow Penny Coleman…makes a heartfelt case for caring for the emotional lives of veterans…Coleman writes of the prevalence of PTSD and suicide amongst Iraq war vets, and how, through opening sharing our stories of loss, we can help heal yet another generation of walking wounded." "Coleman shines revealing light on post-Vietnam-War suicide by thoroughly examining the facts and including excerpts from interviews with other women whose Vietnam-veteran husbands took their lives after the war, women she calls 'Vietnam war widows.'" "By sharing women's stories of suicide and loss, Coleman hopes both to provide a means of healing for the present and to issue a warning for the future. Similar to Keith Armstrong's Courage After Fire: Coping Strategies for Troops Returning from Iraq and Afghanistan and Their Families, this is a well-researched and well-documented publication with a uniquely human touch. An essential part of any public library collection." "Flashback unflinchingly recounts the casualties of war, both political and personal. Coleman's sensitive and insightful interviews and observations give comfort to those of us who also lost our loved ones to suicide. This book's extensive research breaks the silence about suicide in the military and sheds welcome light on this hidden topic." "I'm so glad Penny Coleman has written Flashback, and I am overwhelmed by the research she has put into it. This book is long overdue and should be mandatory reading for all those who have seen combat, including in Iraq, and for those who love them and live with them." "For family members whose veteran relatives committed suicide years, sometimes decades, after the war ended, the Vietnam War will never end. The power of Penny Coleman's book lies in its combination of careful analysis of why the Vietnam War differed from others in U.S. history and direct testimony of the impact of those differences on all of us who survived it. Flashback is a valuable addition to the literature on the war that forms the background to all of America's new wars." "Flashback is a remarkable combination of painful experience and thoughtful interpretation. The descriptions of suicides of Vietnam veterans by women who loved them, together with a wide-ranging exploration of war and trauma, provide a new and original perspective on Vietnam. Coleman then suggests convincing parallels with what American soldiers are now undergoing in Iraq. She concludes with a moving plea that 'we accept the truth that war itself is an illness that sickens our society as surely and in much the same way as it sickens our citizens and our soldiers.' Few authors have done more to confront that sickness as a step toward cure." Read Penny Coleman's speech at BringThemHomeNow.org. Penny Coleman at recent hearings on veteran suicides (NBC News). For more information, visit www.flashbackhome.com.